Sing and String - ZineWiki - the history and culture of zines, independent media and the small press. Sing and String was a folk music fanzine published in Ontario, Canada. The first issue of Sing and String was published by the auspices of the Centre for Adult Education of the North Toronto YMCA by a committee of folk music enthusiasts who held classes on folk music at this location. The committee head, serving as editor, was Sid Dolgay; the subtitle for this issue was "Folk Singing in Canada"; it was a mimeographed publication of 12 pages. The second issue was released in 1960 and was edited by Sue Evans. This issue was 16 pages and contained the article "Folk Songs of Ontario" by Edith Fowke, three songs written for Sing and String by Jack Landers, the folk scene, and a Weavers concert review. The 3rd issue was a 28 page glossy magazine edited by Sydney Banks and released in 1961. It included an editorial opposing Pete Seeger's trial and sentencing, and the articles "Odetta in Concert" by Peter Holloway, "Open Letter to A Critic" by Ted McGillivray, and "Folk Song, the Gentle Tranquilizer" by John Stricek. The 4th issue was subtitled "Canada's National Folksong Magazine" and was edited by Peter J. Holloway. It came out in February of 1962 and included an article on the Matiposa Folk Festival by John Stricek, a review of a Travellers concert, a directory of Toronto's folk clubs, and news from the folk scenes in Vancouver, Ottawa and Newfoundland. Also included are words and music to four folk songs. The 5th issue was released in Winter of 1962-63 and edited by John Stricek. It included the article "Does the Nation Sing?" by J.C. Brannon. The 6th issue was released in Spring 1963 and edited by Bob Leslie and Prunella Clark, who also released issue 7, released in Winter 1964. The 8th issue came out in Spring 1965, under the helm of Paul C. Duchesne. Issue 9, the last issue, was released in Fall 1965 and edited by Joyce Trevelyan. Contributors included J.C. Brannon, Barbara Cass-Beggs, Edith Fowke, Peter Holloway, Ted McGillivray, and John Stricek, among others. 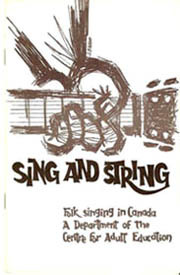 Sing and String was one of a handful of fanzines devoted to folk music that were published in the 1950s and 1960s, along with Ontario's Hoot, and British Columbia's Singalong! ; the U.S.A.'s The Broadside of Boston, Caravan, Gardyloo, The Little Sandy Review, The Songmakers Almanac, and Tune Up; and in the UK, Noise Level and Rambler, followed by Folk Scene in the 1960s and Canada Folk Bulletin and Folks in the 1970s. This page was last modified on 11 April 2018, at 13:00.